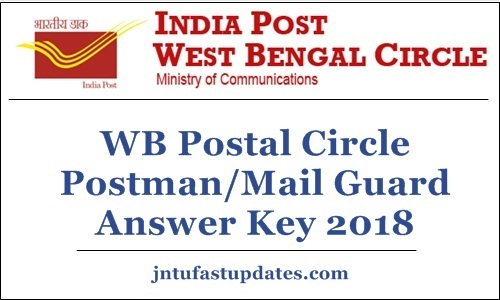 WB Postal Postman/Mail Guard Answer Key 2018: West Bengal Postal Circle has conducted the postman/mail guard examination on 30th September in a large number of examination centers across the state. Many of the competitors seeking to get West Bengal State Government jobs have competed for the written test during the scheduled date and timings. The department of WB post has expressed that this year the competition is high for postman and mail guard vacancies in West Bengal. All the hopefuls clashed for the examination can soon download the answer key from the official website, westbengalpost.gov.in and check the answers from it. Hopefuls competed for the written test round of postman jobs can check the details of WB Postman answer key, cutoff marks, and results from the following article. The West Bengal Postal circle is the state government postal service organization. It is one of the well-established boards of West Bengal state. The organization works for various postal services on the state. It carries out various duties of state-related, nationwide, and international postal services. The department also offers employment for interested and eligible hopefuls every year. The West Bengal Postal circle has recently announced the 239 postmen/mail guard posts. Many of the aspirants having interest in applying for the announced posts have applied for the postman jobs till 17th July. The West Bengal Postal Circle shortlists the candidates based on their performance in written test and interview rounds. On 30th September the WB Postal Circle has organized the written test for thousands of aspirants competing for Postman/Mail guard posts. The examination was conducted in many numbers of examination centers across the WB State. Aspirants competed for the written test of postman/mail guard examination can download WB Postman answer key/WB Mail guard answer key in PDF format, candidates can download the answer key for all sets A, B, C, D and can compare with the corresponding set to calculate the probable score. The competitors can know their future competing levels by estimating the probable score. The answer key will be accessible to download within 3 to 4 days after the examination. The organization will release the answer key in PDF format; aspirants can take a printout of it for further reference. Stay visiting the West Bengal Postal Circle official website, westbengalpost.gov.in to download the answer key. **Note: Not applicable for filling up posts by LDCE as there is no reservation for OBC employees while filling up posts by promotion from MTS cadre. Candidates competed for the West Bengal Postman/Mail Guard written test and waiting to know the result date will have to wait for few more days. The organization will soon notify the result date on its official portal mentioned above. As per the updates from the sources, we come to know that the West Bengal Postal Circle will update the result after a month of the examination. That is, candidates can expect the WB Postman result in the month of October (tentatively). Along with the results, the postal department will also announce the cutoff marks of the corresponding exam. Candidates can check whether they get the announced cutoff marks or not. Hopefuls not scoring as much as the announced qualifying marks/cutoff marks will be dropped from the competition and they will not have the chance to proceed with the next round. The organization will announce WB Postman cutoff marks category-wise, section-wise, and overall scenarios. Candidates have to get the cutoff marks in all scenarios to qualify the test. On the homepage search for the answer key/result link. Soon after the link found click on it. Provide the required details such as register number/ID, Password etc. Check with the answer key/result and take a printout for the future reference.